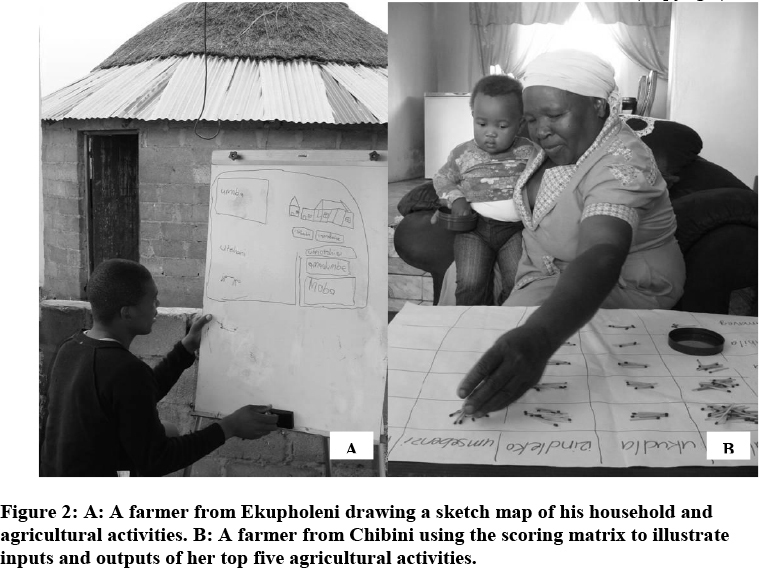 Participatory, mixed-methods research was conducted to study the role of sugarcane in small-scale sugarcane farmers' livelihoods in the Noodsberg area, KwaZulu-Natal. Thirty-five farmers were visited at their homes and data was collected through semi-structured interviews, participatory sketch mapping, matrix scoring activities and informal field-based discussions. Results indicated that sugarcane was a key livelihood resource providing employment and income, and it generated more income than any other single agricultural enterprise. It was considered the most important crop in most households, even though it was grown within a diverse agricultural system including maize, beans, taro (amadumbe) and potatoes. Considering the important role of sugarcane as a cash crop in farmers' livelihoods, further development of land to sugarcane in the Noodsberg area will continue to reduce poverty and improve the livelihoods of farmers. Keywords: farming systems, food security, poverty, rural development, small-scale growers, sugarcane. The contribution of sugarcane to small-scale farmers' livelihoods in KwaZulu-Natal, South Africa is recognised (Bates & Sokhela 2003) but poorly understood (Eweg, Pillay and Travailleur 2009). In 2011, there were 29 130 registered sugarcane growers in the South African sugar industry. Of these, 27 580 were small-scale growers (SSGs) and in the 2010/2011 milling season 13 871 SSGs delivered sugarcane for milling, contributing 8.6% of the total crop delivered to mills (SASA 2011). The average sugarcane yield of SSGs is markedly lower than that of large-scale growers (LSGs) and this has been ascribed to a number of factors, discussed in more depth by Eweg (2005), Mahlangu and Lewis (2008), Armitage, Hurly & Gillitt (2009) and Sibiya & Hurly (2011). There is little evidence, in the literature, of research into SSGs agronomic production constraints in South Africa, and understanding farmers' perceptions of their production constraints is seen as an important precursor to successful implementation of best management practices (BMPs) and successful extension programmes (Van Huis and Meerman 1997, Orr 2003, Nederlof, Tossou, Sakyi-Dawson & Kossou 2004, Röling, Hounkonnou, Offei, Tossou & Van Huis 2004). Due to increased extension activities and involvement of multiple stakeholders with the SSGs in the Noodsberg mill supply area (Gillespie & Mitchell 2006, Gillespie, Way, Webster, Mitchell, Ramay & Maher 2009, Gillespie, Mitchell, Way, Webster & Witthöft 2012), their sugarcane yields and production in this region have been increasing. This is in contrast to most other mill supply areas in the South African sugar industry, as reported by Dubb (2012), where sugarcane yields and production are in decline and the contribution of sugarcane farming to household income is small compared to other income sources. There is thus a need to improve understanding of how sugarcane fits into these SSGs' diverse agricultural systems, and to explain the contribution which sugarcane makes to rural livelihoods in the Noodsberg area. The aim of this study was to explore the role that sugarcane plays in SSGs' livelihoods in one particular sugarcane mill supply area (Noodsberg) in KwaZulu-Natal, South Africa, and to explore SSGs' perceptions of their sugarcane production constraints. 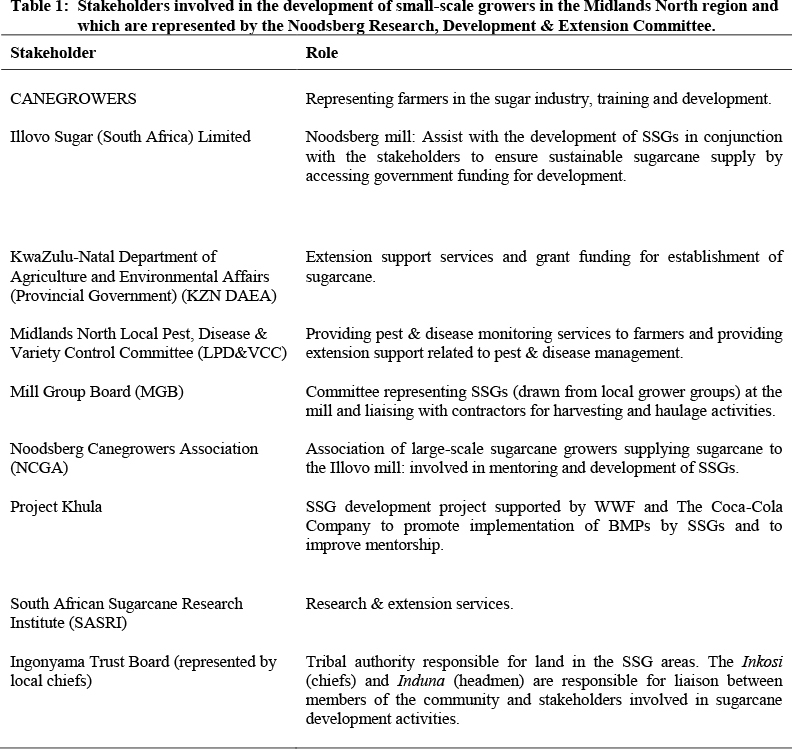 This paper describes data collection and analysis methods, provides a synthesis of results and discusses the implications of the findings for rural development, extension and stakeholder engagement with SSGs in the Noodsberg area in particular, but also in other parts of the South African sugar industry. The research was conducted in the Midlands North sugarcane growing region of KwaZulu-Natal, South Africa. 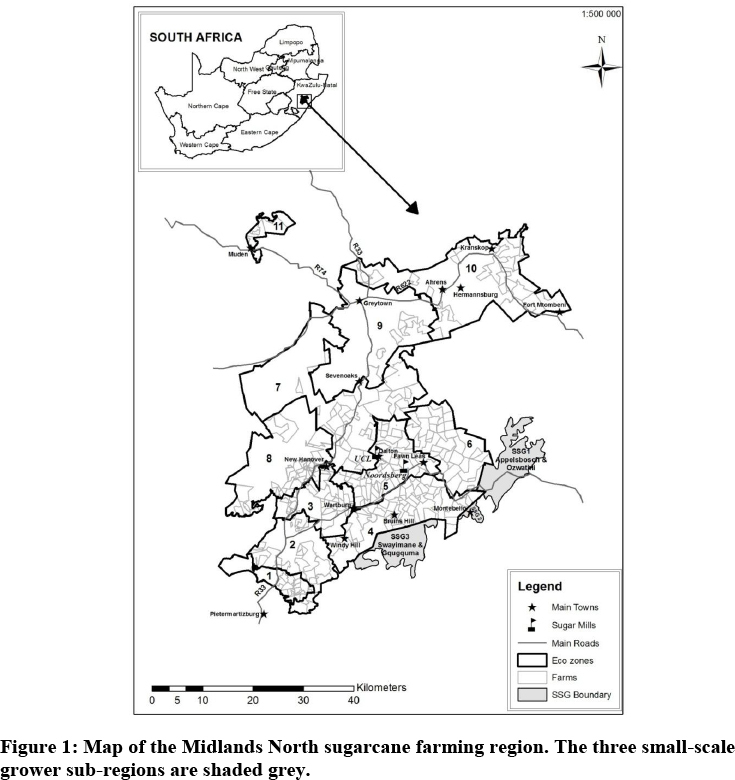 Growers in this region supply sugarcane to the Illovo Sugar (South Africa) Limited mill at Noodsberg (29°21'38.83"S, 30°41'13.37"E) in KwaZulu-Natal, South Africa (Figure 1) (SASA 2011). In the 2010/2011 season, 240 SSGs delivered approximately 24 000 tonnes of sugarcane to the Noodsberg mill. According to data from the mill, the average number of SSGs delivering sugarcane since 2008, is 232 per annum. From these data it was extrapolated that average yields for the last season were 68 tonnes per hectare per SSG (personal communication, F. Horn, Illovo Sugar Limited mill, Noodsberg, KwaZulu-Natal, 27 August 2012). Multiple stakeholders are involved in the development of SSGs in the Midlands North region (Gillespie, et al. 2012). These are represented by the Noodsberg Research, Development & Extension Committee (Table 1). "You're here again! You're here every day. We should build you a house in our community." We took this as a positive indication that the participants were becoming familiar with our presence in the community and would thus engage with us more freely. Although participants were primarily from communities in the Swayimane area (labelled 'SSG 3' in Figure 1), communities from the other two SSG sub-regions of the Midlands North sugarcane growing region (indicated in Figure 1), were also represented. Thirty-five individuals were visited at their homes for the survey, which represents 15% of SSGs actively delivering sugarcane to the mill. A mixed methods approach was used for data collection. A combination of quantitative, qualitative and participatory approaches to sampling was employed (Mayoux & Chambers 2005, Creswell 2009). This approach is well suited to the world view which underpins this particular study, namely pragmatism with some elements of constructivism (Creswell 2009). Identifying the researcher's world view is recognised as an important aspect in the preparation of a research design in the social sciences (Creswell 2009, Eweg, Pillay & Travailleur 2009). In mixed methods research, both quantitative and qualitative data are collected, analysed and combined. This results in a better understanding of research problems, compared to quantitative or qualitative research methods on their own (Creswell 2009). All data collection activities were conducted in isiZulu, which is the home language of the SSGs in the study area. Data was collected through household visits and individual interviews with SSG's and comprised four activities: participatory sketch mapping, interview questions, participatory matrix scoring and informal field-based discussions (Table 2). Guidelines for how to run the participatory sketch map and scoring matrix activities were taken from Pretty, Gujit, Scoones & Thompson (1995) and Chambers (2002). Upon arrival at the SSGs homes, the study was explained to the participants, they were asked whether they were prepared to participate, and the privacy of their information was guaranteed. 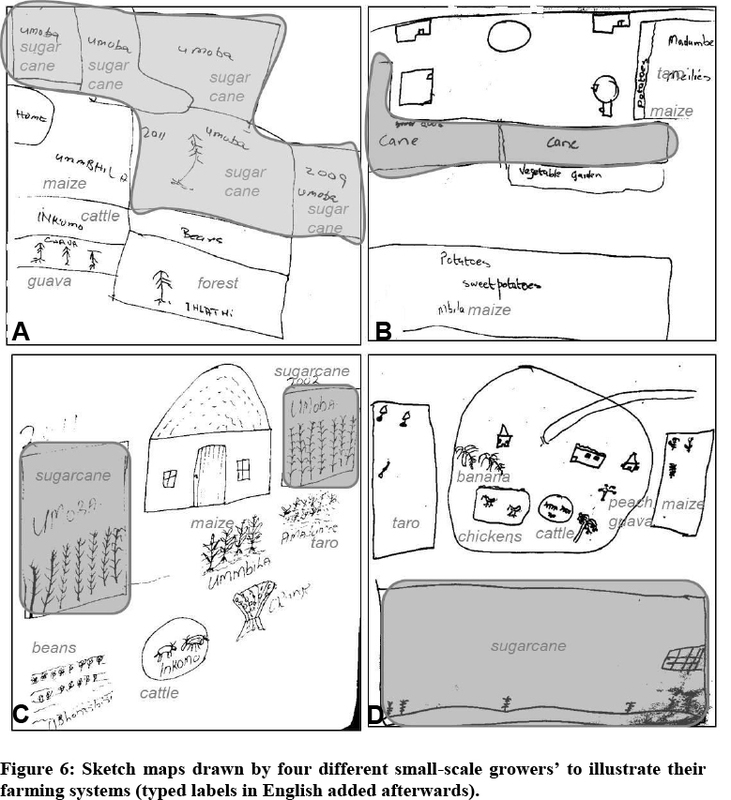 They were asked to start by drawing a map of their farming enterprises (Figure 2). This was a good way of putting the participant in a position in which they taught the researchers about their farm, rather than passively learning from outsiders, as often occurs in rural development projects (Chambers 2008). The map allowed a focus for discussion and for questions to be asked about the various agricultural enterprises in which the participant was engaged, including crops and livestock (Figure 2 A). The sketch map activity was followed by a semi-structured interview in which further information was collected by asking open-and closed-ended questions (Table 2). The third activity during the household visits was participatory matrix scoring. During this activity, the researchers drew a matrix onto a flipchart. The top row of the matrix indicated outputs and inputs of agricultural enterprises (outputs: income, food; inputs: costs, labour, time) and in the first column of the matrix the SSGs' top five agricultural enterprises were listed (crops and livestock). In order to allow ranking and quantitative assessment of data, participants were given a box of 220 matches. They divided all the matches into the cells across the matrix, indicating their most important crops and livestock and how much each farming enterprise cost them (inputs) and how much food or income it earned them (outputs) (Figure 2 B). For example, a participant would place a large number of matches in the matrix cell for sugarcane income to indicate that sugarcane made a large contribution to household income. Conversely, to indicate that sugarcane contributed little to household income, he or she would place fewer matches in that cell. Allocating a 'restricted overall score' by allowing a fixed maximum score in a matrix (in our case 220 matches), allows for more rigorous statistical analysis than allowing participants to choose the scores themselves (Maxwell & Bart 1995). Using scoring rather than simply ranking of items within a matrix ensures a more accurate analysis can be made, since the 'distance' between ranks is better measured when using restricted overall scoring (Maxwell & Bart 1995, Abeyasekera 2001). The mapping and matrix activities were recorded using photographs. Participants were asked whether they were prepared to have their photographs taken and the purpose of the photographs was explained to them. As a fourth activity, participants were asked to show the researchers their fields and explain constraints and difficulties faced in managing their crops. This allowed for a more informal and relaxed interaction with participants. Field observations and notes about each participant were recorded by the field researchers in writing after each house visit was completed. The notes were captured according to the following topics: general impressions of the SSG and the household, impressions about what sugarcane means to the SSG and the household and impressions about constraints to cane production, including observations of field conditions. The observations were used as a qualitative validation of the quantitative data collected during the interview and of the findings of the mapping and matrix activities (Creswell 2009). Descriptive statistics, such as frequency distributions and percentages, were used to analyse and report responses to questions in individual interviews during house visits (Gillespie & Mitchell 2006). Content analysis was completed on open-ended questions during the individual SSG interviews to identify recurrent themes which could be quantified to determine SSGs' perceptions (Gillespie and Mitchell 2006, Creswell 2009). Answers to questions were categorised into topics which were divided into further categories. For quantification and analysis, the frequency of mention of each category within a topic was recorded. The topics and categories identified during the interviews are shown along with the results in the pie charts (Figures 3, 4, 5 and 6). Sketch maps were interpreted subjectively by identifying patterns in the relative size of sugarcane fields compared to other crop fields and as a qualitative data source to complement findings of the other data sources, and as was mentioned above, they were used primarily as a facilitation tool during the process of data collection. For analysis of the scoring matrix activity per SSG interviewed, the total number of matches per cell was counted and captured in a spreadsheet. Since the data were found to be non-parametric, the median number of matches per cell was calculated for each variable. The median was used to determine how much sugarcane and other agricultural enterprises contributed to household outputs and inputs. The median scores, i.e. median number of matches, for each variable were represented using box and whisker plots and were analysed using a Wilcoxon signed ranks test to determine whether there was a statistically significant difference between the various variables (Admassu, Nega, Haile, Abera, Hussein & Catley 2004). The top five agricultural enterprises listed during the matrix scoring activity were further analysed using free-listing and the frequency of mention (Gurung 2003, Quinlan 2005). The importance of crops or livestock listed during the listing activity can be inferred from the frequency of mention across all respondents and also by calculating a free-list salience index (SI). The SI is a product of the frequency of an item across all lists, and its average rank across all lists, which is given as a percentile rank (Smith 1993). The percentage frequency and the average percentile rank are multiplied to give an SI, which can be calculated for all items mentioned in all lists (Smith 1993). SSGs' responses during interviews, sketch map drawings of their farming systems and the results of the participatory matrix scoring activity all showed that sugarcane plays an important role in the farming system and livelihoods of these households. Farming in general, as well as farming of sugarcane specifically, are seen as a major livelihood resource by the SSGs (note that sugarcane has been abbreviated to 'cane' in Figures and Tables) (Figure 3). When SSGs were asked what their main source of income was, almost half of them (46%) stated sugarcane (Figure 4). Employment or other business activities are second to sugarcane as a source of income for many of these farmers. When SSGs were asked what they mainly used the income from sugarcane for, most of them indicated food (42%) and education (26%) (Figure 5). "This is my work. I don't need to go to work for a company far away, because sugarcane is my job." "I don't need to go to the mines to work like other men. This is gold (pointing at the soil), this is where I can earn a living to support my family, right here. " "My neighbours used to call me a fool for growing sugarcane. But now they see: I got married, I've built a house and I've got running water in my house to wash when I get home in the evenings." Four sketch maps (Figure 6) were specifically selected from the entire sample as visual illustrations of how sugarcane integrates into the farming system. The areas shaded in grey represent sugarcane fields. The sketch maps indicate that most SSGs committed a fairly large portion of their farming land to sugarcane, however this varies between SSGs: in these examples the relative size of sugarcane fields drawn on the maps is equal to or larger than any other crop fields. In all but one case (Figure 6 D), SSGs have more than one field of sugarcane. The maps also demonstrate that these SSGs are engaged in multiple agricultural enterprises, including various food crops, livestock, fruit trees and timber. 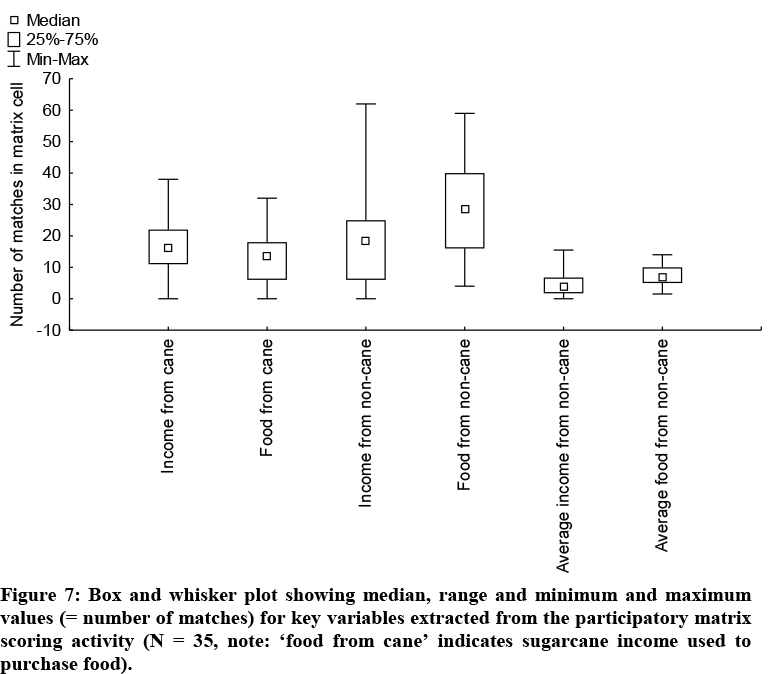 Analysis of the participatory matrix scoring confirms the important role which sugarcane plays as a form of income. The variables used for this analysis were income from sugarcane, food from sugarcane (which indicates sugarcane income used to purchase food), income from non-sugarcane agricultural enterprises (total), food from non-sugarcane agricultural enterprises (total), average income from non-sugarcane agricultural enterprises and average food from non-sugarcane enterprises (Figure 7 and Table 3). The results of the Wilcoxon signed ranks test carried out on these variables (Table 3), indicate that income from sugarcane, although higher, is not significantly more so than total income from non-sugarcane agricultural enterprises (Figure 7). The income from sugarcane is however significantly larger than the average income per non-sugarcane enterprise. Sugarcane generates more income than any other non-sugarcane enterprise on its own. Similarly, although the total food from non-sugarcane enterprises is significantly more than that brought in by sugarcane, when the food from non-sugarcane enterprises is averaged, then it is significantly less than the food brought in by sugarcane. 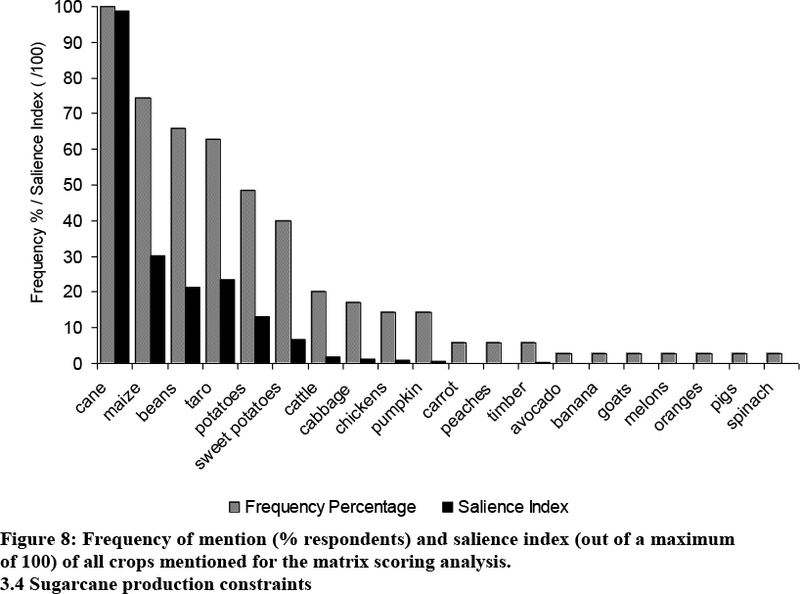 The matrix scoring analysis furthermore demonstrates the diversity of agricultural enterprises in which these SSGs are engaged. The free-listing analysis of crops showed that sugarcane was indeed considered the most important crop by participants. It was mentioned most frequently of all crops, and most often listed first in the list of top five crops. It therefore had the highest salience index (SI) of 98.6 out of a possible maximum of 100 (Figure 8). The second most important crop was maize, with a SI of 30.4, only a third of the value of the SI of sugarcane. Taro (amadumbe) (SI = 23.4), beans (SI = 21.4), potatoes (SI = 13.1) and sweet potatoes (SI = 6.7) were the other vegetable crops mentioned (Figure 8). The most important livestock listed was cattle which, compared to the SI of the top food crops and sugarcane, had a very low SI of only 1.94. This was confirmed by field observations, where it was noted that the majority of SSGs did not control weeds effectively in their sugarcane fields. In most cases they were using herbicides but applying them incorrectly. Weeds were found to be a problem in young sugarcane (recently planted or ratooning/re-growing after harvest) as well as in older, more established sugarcane. During household visits SSGs were often engaged in weed control activities (hand-hoeing or application of herbicides) and this provided us with the opportunity to discuss these practices with them. In these informal discussions it was found that the majority of SSGs used Velpar® K3.0 (Hexazinone + Diuron) on young sugarcane as the primary herbicide. It was also observed that they applied this herbicide at rates higher than recommended and too late in the growing cycle of weeds and sugarcane. The product was applied indiscriminately on plant and ratoon cane, despite the fact that it is recommended for ratoon cane only, and high rates can have damaging effects on sugarcane growth (SASRI 2010). Their practices for measuring and mixing the herbicide product with water were also not according to recommendations and resulted in over-application of product in most cases. The multiple methods used in this study all support the finding that sugarcane makes an important contribution to the livelihoods of SSGs in the Noodsberg area of the Midlands North region. For many SSGs, sugarcane is a primary livelihood resource (Figure 3), which is in contrast to the findings by Dubb (2012) in the Umfolozi mill supply area, who found a much higher reliance on government social grants such as old-age pensions and child support grants. While sugarcane is perceived as the main source of income by many in the Noodsberg region, it plays a role in income diversification as households also receive income from other employment, business activities and government social grants (Figure 4). This contribution of sugarcane to a multi-livelihood strategy of rural sugarcane communities has been recorded in other parts of KwaZulu-Natal (Mtshali 2002) and is recognised in the South African sugar industry as an important contribution to rural development (Madhanapall 2012). Respondents indicated that they use the income from sugarcane to pay for food and education (Figure 5). Sugarcane as a cash crop therefore makes an important indirect contribution to food security as it allows for families to purchase much-needed food staples. Other than contributing income to households, cash crops can have other spill-over benefits on food crop production for example by improving farmers' access to resources such as fertilisers and agricultural loans (Govereh & Jayne 2003), and this potential benefit of sugarcane income warrants further investigation. The importance of sugarcane for rural households is recognised elsewhere in the literature (Armitage, et al. 2009, Eweg, et al. 2009, Sibiya & Hurly 2011), but this is the first time a quantified detailed study, using recognised participatory, mixed methods approaches (Mayoux & Chambers 2005, Creswell 2009) has been conducted with SSGs in KwaZulu-Natal. It is an important contribution to understanding how sugarcane farming supports rural livelihoods and is part of an integrated farming system, and therefore merits continued effort to improve support services for these SSGs from multiple stakeholders (Armitage, et al. 2009). Declining SSG sugarcane yields is a concern for the South African sugar industry (Parsons 2003, Eweg, et al. 2009, Thomson 2010, Sibiya and Hurly 2011). Although reduced yields have subjectively been ascribed to a number of factors, no study has been conducted to identify specific crop husbandry or agronomic production constraints as perceived by SSGs. A preliminary report on a survey conducted in Mauritius and South Africa (Eweg, Pillay and Travailleur 2009, Canegrowers 2011) indicated that poor re-plant rates may contribute to reduced yields, along with low levels of education which contribute to poor crop husbandry practices among SSGs (Canegrowers 2011). Our finding that these SSGs perceive weeds as the top agronomic constraint appears to be the first published record of such a perception. In the recent past, there have been numerous publications on improving weed management practices amongst "emerging" sugarcane farmers (defined as both SSGs and new freehold growers) in the South African sugar industry, which indicates a recognition of weeds as a major constraint, and a need for research and extension to continue addressing crop protection practices amongst SSGs (Campbell, Leslie, McFarlane, Berry, Rhodes, Antwerpen, Rutherford, Antwerpen, McElligott and Conlong 2009, Campbell, Gillespie, Rhodes, Leslie, Phewa and Smit 2010, Conlong and Campbell 2010). Weed management should therefore be prioritized as an extension topic for the SSGs in the Noodsberg region of the Midlands North region. This can be achieved by incorporating it into the demonstration plot programme of work which is currently being used for extension in this region (Gillespie, et al. 2009, Gillespie, et al. 2012). SSGs also identified high input costs as an important constraint. This finding is supported by other studies (Armitage, Hurly & Gillitt 2009, Thomson 2010). According to Eweg (2005), high costs of fertilizers may be one of the major constraints on SSG yields, implying that SSGs do not apply enough fertiliser. Since the SSG households interviewed grow sugarcane in a diversified agricultural system together with other crops and they keep livestock, there is the potential for farmers to be subject to multiple and conflicting messages from extension and support stakeholders involved in these various agricultural enterprises. This has been the case, for example in Lesotho (Molomo 2012). It is therefore important that extension and support stakeholders in this area communicate effectively with each other, and that good linkages are developed (DÜVEL 2005) so that the SSGs' constraints, such as high input costs and weed control as identified in this study, can be addressed effectively. This study has shown that sugarcane plays an important role in the livelihoods of SSGs in the Noodsberg area of the Midlands North region, as it contributes to household food security and provides money for education. Sugarcane is considered the most important crop within a complex of crops and livestock which are farmed in an integrated system. Weeds and high input costs are perceived as the biggest constraints to sugarcane production by the SSGs in this area. It is recommended that extension activities in the Midlands North region prioritise weed management for SSGs and that stakeholders' efforts to reduce SSGs' input costs continue. The important role which sugarcane plays in the livelihoods of these SSGs means that improvements in yields will not only impact positively on household income and food security, but will also improve the sustainability of sugar millers and the associated industry in the region as a whole. The authors would like to thank all the farmers who participated in the survey activities for their time, their hospitality and their willingness to share their knowledge and experience. Thanks to the local Extension Officers and assistants, Mr W. Gillespie, Mr. B. Sithole, Mr. G. Mdunge and Mr. M. Ndlangamandla, for introducing us to the farmers. We would like to acknowledge Dr. S. Ellis from North-West University, Potchefstroom Campus, for assistance with statistical analysis. Funding for the project was provided by the National Research Foundation of South Africa: NRF Incentive Grant for Rated Researchers (ConlongIFR2008041400013), the NRF-DAAD In-country scholarship programme, South African Sugarcane Research Institute (SASRI), North-West University, The Coca-Cola Foundation and the WWF.